Expected top 4 had the College Football Playoff system been in effect last season. First off, there needs to be a better way to describe this. The “playoff” is four teams, but there was a championship game under the BCS and you could describe the other major bowls as “BCS bowls” without confusion. CFP (college football playoff) bowls maybe? I guess I’ll call them that. If you’re not aware, there is a three-year rotation for the semifinals. Year 1: Rose and Sugar. Year 2: Orange and Cotton. Year 3: Fiesta and Peach. So I’m going to go through all three possibilities using last year’s pre-bowl rankings. Rose: Florida St. vs. Michigan St. However, I don’t think it would have happened that way. I think given that Alabama did not have a particularly strong non-divisional schedule (Tennessee, Kentucky, Virginia Tech, Colorado St., Georgia St., Chattanooga), did not win the conference, and lost its final game, they would have been seeded no higher than 4th. When the loss takes place isn’t stated as a criteria, but I can’t imagine that wouldn’t influence the results. I don’t think Stanford, which had the toughest schedule according to many and which won its conference, would have gone ahead of Alabama, but that’s another possibility. I would have picked Stanford myself. I’ll just go with Alabama though for this exercise. I think making them #4 instead of #3 would have been a significant enough departure from all the major polls. Rose: Auburn vs. Michigan St. The Orange Bowl is the only one where we have any guidance really since the ACC #1 goes to the Orange Bowl if it’s a year where the Orange Bowl is not a semifinal. In this case, it’s actually the ACC #2 since the ACC #1 obviously would have made the semifinal. I think with a fairly highly-ranked alternate of the same conference, the Orange Bowl still would have picked Clemson. The other Orange Bowl spot is for and SEC or Big Ten #2 or Notre Dame. I don’t think they would have fought the Cotton Bowl over Missouri, and Ohio St. was a very attractive pick, so actually, that’s the one relevant bowl that I don’t think would have changed. Cotton: Auburn vs. Michigan St.
It’s a little more straightforward not to have the Rose and Sugar as part of the semifinals. My understanding is that in Years 2 and 3, the SEC takes the highest non-semifinal Big XII and SEC teams no matter what, and the Rose Bowl takes the highest Big Ten and Pac-12 teams no matter what. To editorialize for a moment, I don’t know why the Rose and Sugar would be paired as semifinals. It should be like Sugar Fiesta one year, Rose Peach the next, and Orange Cotton the next. That way you’re only disrupting one major bowl arrangement at a time. In the years that the Pac-12/Big Ten game doesn’t take place, there should still be the SEC/Big XII game and vice versa. Rose: Stanford vs. Ohio St.
Fiesta: Auburn vs. Michigan St. These years will be the most restrictive since there are three bowls with pretty specific formulas. I looked at the anticipated bowl lineup and used my best guess as to how it would have worked had next year’s bowls all been in place last year. 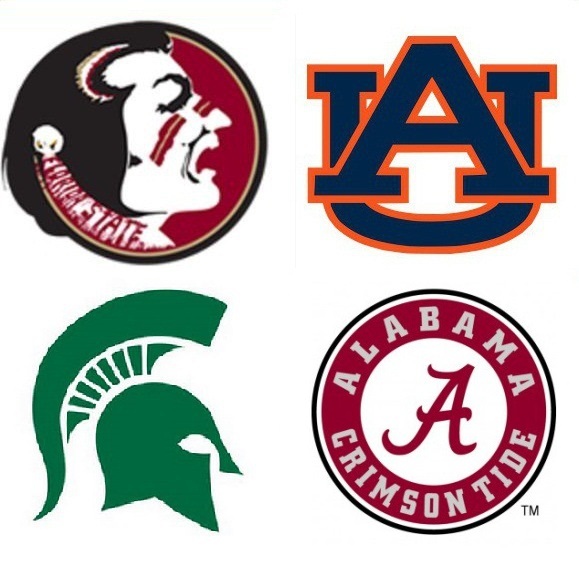 Keep in mind that there were two more bowl slots among the major bowls since last season, there was a national championship game made up of two separate teams, but this season it will be made up of winners of bowl games. Oklahoma St. would have been bumped in my estimation so it would not have played in the Cotton Bowl. The Peach Bowl will be very different, so neither Duke nor Texas A&M would have been under consideration for the new CFP bowls. In the case of Texas A&M, however, I think their spot in what will be a major bowl would have been taken by another SEC team: in this case South Carolina. So that would leave the Big XII and the ACC with another team for the remaining bowls, pushing the other teams of that conference down the ladder. I do think some of the bowls would have been the same due to regional interests. It made sense to have two Louisiana teams in the New Orleans Bowl, for instance. It made sense to have Maryland playing in Maryland and North Carolina playing in North Carolina. The bolded teams are those who were bowl-eligible but did not actually play in bowls last season. There were a record number of bowl-eligible teams last year, so I’m not entirely sure there will even be enough bowl-eligible teams next year. I guess the NCAA will cross that bridge when it comes to it. This is just an informal sort of exercise, so don’t make a big deal out of it. I’m going by what I’m told the rules will be next year as far as the preferred conferences, etc. Most conferences do not fill all their contractual slots though. I wasn’t always sure which bowls would have gotten the #8 team from a given conference and which would have had to find another team. New Mexico: Washington St. vs. Colorado St.
Las Vegas: USC vs. Fresno St.
Miami Beach (new): BYU vs. Texas St.
Hawaii: Oregon St. vs. Boise St.
Russell Athletic (Orlando): U. Miami vs. Ball St.
Holiday (San Diego): Nebraska vs. Arizona St.
Texas: Texas Tech vs. Mississippi St.
San Francisco: Washington vs. San Jose St.
Valley of the Sun (Tucson, AZ): Michigan vs. Kansas St.
GoDaddy (Mobile, AL): Bowling Green vs. Arkansas St.
*It may have been the case that due to the fact that LSU plays Wisconsin to start this season, this match-up would not have been made. It’s possible that Georgia would have leapfrogged LSU, leaving the Tigers playing Iowa anyway. But as I said at the top of the section, it’s just sort of a rough guess. I left LSU there because they were apparently seen as the more desirable team. Also, some may recall Miami played Florida St. in a bowl game in 2003 only to play them again at the start of the 2004 season.